I developed the Cloak of Gratitude,over the course of a year. I made the base of the cloak by by piecing together found crochet with sections I crocheted. I asked a wide range of people to contribute statements of gratitude using the format: I am grateful that . . . or I am grateful for . . .
As a daily practice I chose one gratitude statement I received to write onto a cloth ribbon and tied it into the cloak. I also wrote one of my own and included that as well. The cloak was exhibited as part of a Violence Transformed exhibition at Roxbury Community College in August 2014, and at Jamaica Plain Open Studios in September 2014. 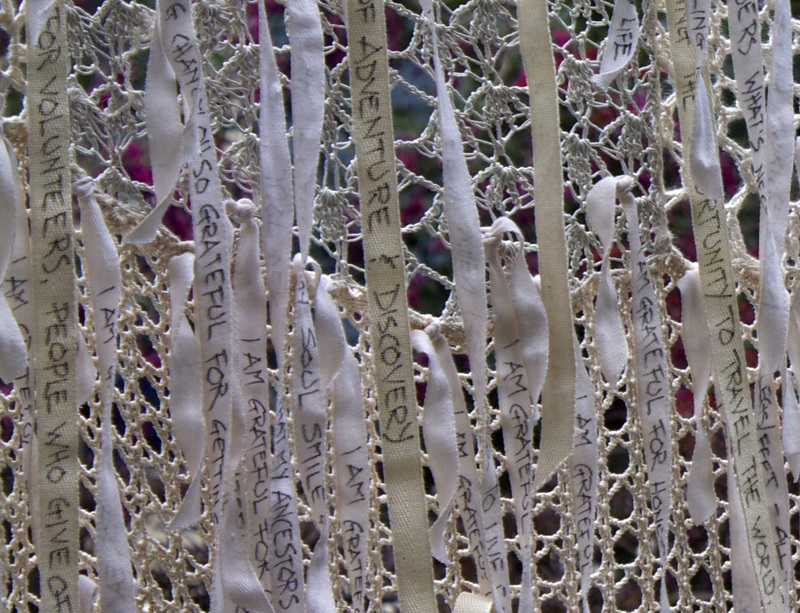 In both cases I invited gallery visitors to add their statements of gratitude and incorporated them into the cloak. At present I am working with a choreographer to craft a performance piece using the cloak, and am using some to the statements as seeds for small drawings.